Leo Orana Prestashop Theme is a fantastic multi-homepage Prestashop theme in version 1.7.2.x. 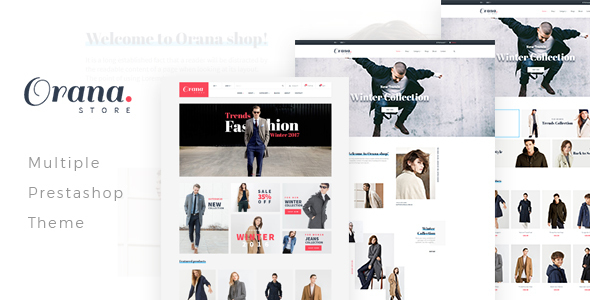 Leo Orana is designed for any e-commerce store, especially suitable for fashion store. Its responsiveness makes it possible to be nicely displayed and absolutely adjustable in any screen sizes like desktop, tablet, laptop, or mobile phone. Leo Orana Prestashop Theme is a perfect combination of powerful modules from Leo Theme like Leo Megamenu, Ap Pagebuilder, Leo Slideshow, and Leo Blog. Its elegant and modern look makes Leo Orana Prestashop Theme a beloved one right at the first sigh. It’s a must to stress Leo Megamenu with two types of menu, which are horizontal menu and vertical menu. These types make your site flexible, customizable as you want. Moreover, beside the basic features of Ap Pagebuilder module like integrating many widgets, allowing users to build a well-organized layout by simple manipulations drag and drop, Ap Pagebuilder module with Count down feature helps admin manage to set the time for event or promotion, etc. Importantly, Leo Feature with the newest update feature Fly Cart allows admin to create Fly cart with multi types such as dropdown, dropup, Sidebar left, sidebar right, sidebar top, sidebar bottom. The purchasing is now more convenient and interesting to customers as they can easily control what they add to cart, choose to buy or remove the selected product from their cart at every page on the site. As a result, users do not need to go to the checkout page for each time they want to check their cart, which is very time-saving. Moreover, the powerful Panel tool permits user to selecting the layout style that they want or colors, float header. Live theme editor with many configs in terms of background, text font, font-size, text color, etc. Finally, Leo Orana supports Css3, Html 5, RTL language layout and Bootstrap 4 Framework, which helps to create refined web pages with semantic accuracy and highly customizable prestashop theme.